Mice don’t eat much per sitting – just a few grams – but they eat all the time. They eat so much partly because they’re constantly scurrying around, which burns calories. They also need to eat all the time to wear down their incisors, which grow continuously. If left unchecked, overgrown teeth can cause serious dental problems for mice and rats, as well. In fact, rats solve their growing-tooth problem by gnawing on anything and everything, including bricks, cement and lead pipes. Despite the cartoons you watched as a child, mice don’t prefer cheese over any other kind of food. Pest control experts usually recommend loading mouse traps with peanut butter instead of cheese as mice are more likely to be drawn to the sweetness of the peanut butter. Mice in your home will eat whatever they have access to in your pantry or on your counter, including bread, meat and their own feces. Though they spend the majority of their time on dry land, rats are exceptionally good at treading water. In fact, they can stay afloat for several days if necessary. They can even survive being flushed down the toilet if for some reason you want to try eliminating your rat problem that way. Utility pipes that contain water are a common access point into homes for rats and mice. Contrary to popular belief, there are no rats anywhere that are as large as cats – not even in New York City. The two most common species of rats, the Norway rat and the black rat, average one pound each, while the average house cat weighs between 8 and 10 pounds. 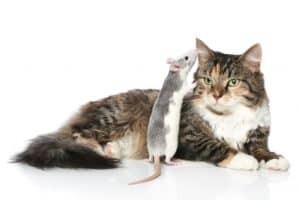 While you may think this is the ideal ratio to make cats the ultimate rat-hunting weapon, the truth is that rats are too prolific and they’re able to slip into spaces cats can’t reach. That means that even the hardest-working cat will have a tough time keeping up with your rat infestation. As far as pests go, rats and mice are relatively smart when it comes to adapting to rodent control methods. They usually will not fall for the same trap twice, which is something you may have noticed if you have ever employed a reusable mouse trap. Researchers have determined that rats have the ability to understand the concept of cause and effect and that performing an action, like stepping into a trap, will end badly for them once they’ve seen it happen. For the best, professional rodent removal service in Frisco, TX, call Safe Pro Pest Control at (972) 435-0700 or visit https://safepropest.com/.